Alpha Chi Sigma chapters participate in a variety of outreach programs both at their university and throughout their community. To encourage and recognize participation in science outreach programs, the Fraternity awards wyvern pins for activities that promote the Second Object. Program participants can earn one pin in each of four levels. Visit the bottom of the Forms and Reports page to find a form for each level, as well as the Wyvern Policy document indicating requirements. Bonding with Color is a fun science outreach activity for people of all ages. The ages and interests of the participants determine how much science and chemistry is presented. Thanks to Anne Moody at Truman State University for creating and sharing these materials! 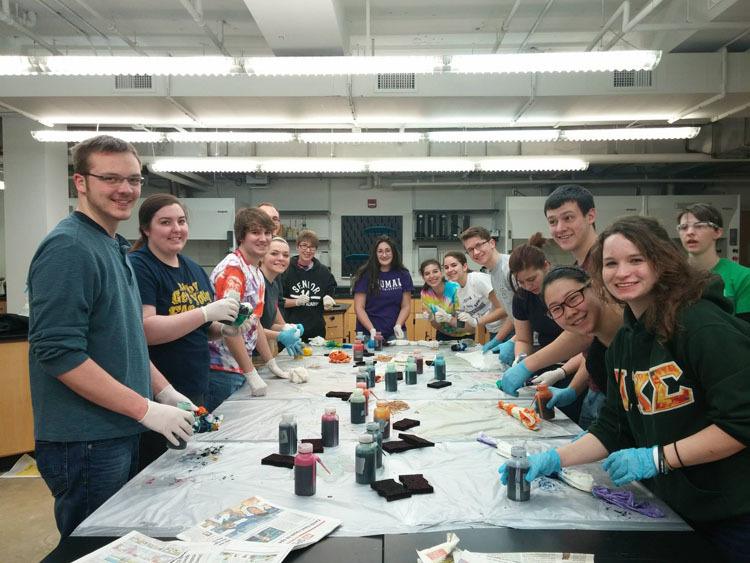 First-time dyers should ask for the Alpha Chi Sigma kit, which contains a set of dyes, squeeze bottles, and enough chemicals to dye about 100 t-shirts. They also sell shirts and dresses that can be tie dyed. We strongly recommend this vendor due to their past record of excellent and quick service. There are a variety of other sources for supplies. ShirtSupplier.com is a good source for shirts, shorts, bags, and other products to dye. Gamma Theta has used River's End Trading Company as their usual source for shirts.